Zone 2 Tube and London Overground station on the Jubilee Line and the East London Line. 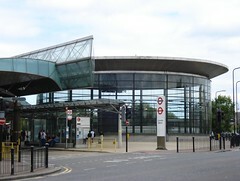 It has two entrances, one on each side of Surrey Quays Road. Although it looks on the map as though you might be able to reach it from the north via the estates off Albion Street, this is not the case. There's a bus station here too. In the bus station there are toilets, which close at 8pm. There is a disabled toilet controlled by a radar key. Last edited 2013-10-11 10:14:51 (version 10; diff). List all versions. Page last edited 2013-10-11 10:14:51 (version 10).